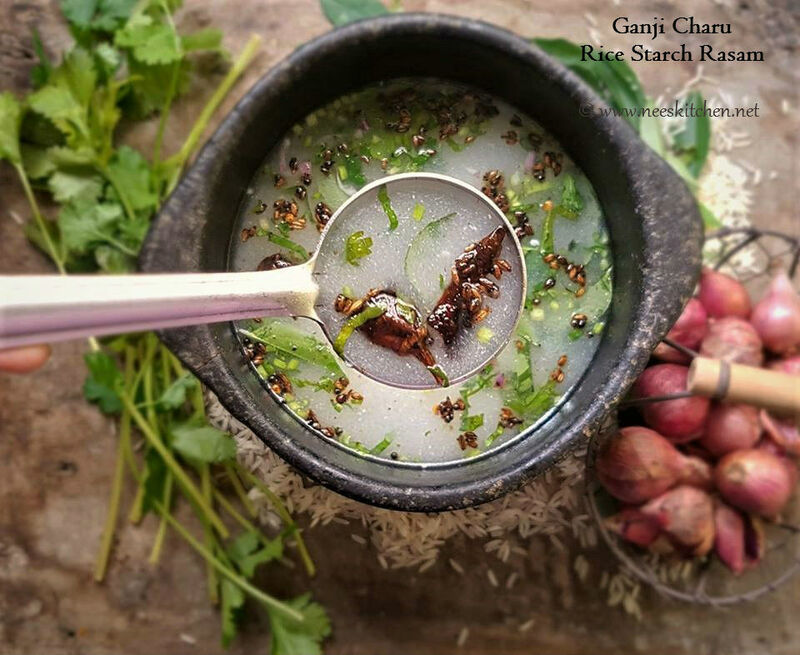 Ganji Charu | Arisi Kanji Rasam | Rice Starch Rasam is a simple soup with very minimal ingredients. Rice starch gives instant energy and is also ideal for stomach issues such as diarrhea & constipation. This is best when consumed in summers as rice starch helps to overcome dehydration issues also. Video on how to remove starch from rice. 1. To begin making the ‘Ganji Charu | Arisi Kanji Rasam | Rice Starch Rasam’, prepare the rice starch. Refer Rice starch video. 2. Once the rice cooked, immediately remove it from the heat and strain the starch water through a large colander and collect the starch it in a deep vessel. On the other hand, transfer the rice to a separate serving bowl and use it for consumption. 3. 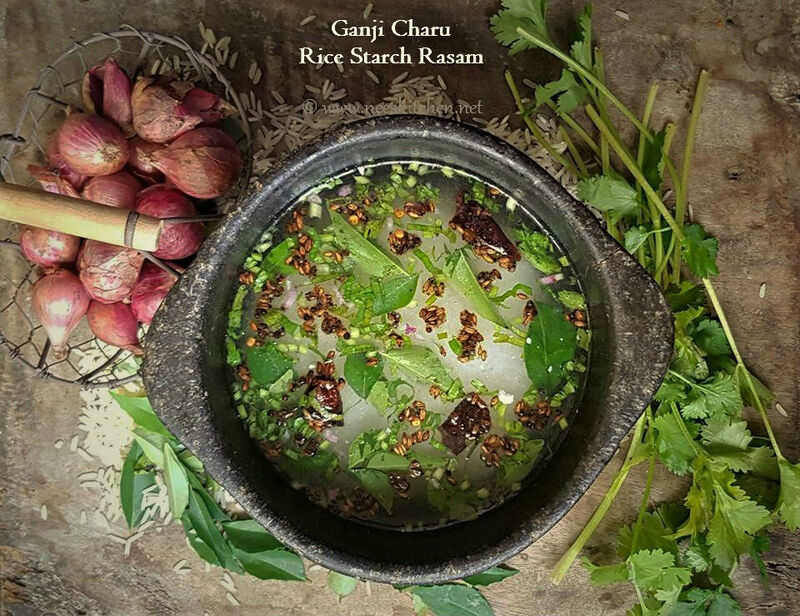 If you are preparing this rasam immediately after the starch is collected, you need not reheat the starch as it is already very hot. However, if you are preparing at a later stage reheat the starch until it comes to a rolling boil and switch off the flame before you start to add other ingredients. 4. Continue to prepare the ‘Ganji Charu’ by pouring butter milk which is at room temperature and give it a mix. 5. Add salt, fresh curry leaves, finely chopped small onion, finely chopped coriander leaves and mix well. 6. Begin the tempering by heating ghee in a small pan, add mustard seeds and as they splutter, add one dry red chili & cumin seeds. 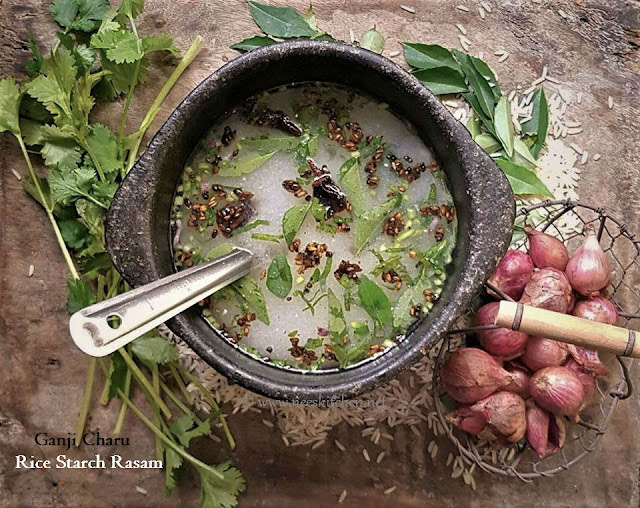 Once the cumin seed is fried, Pour the tempering to the rasam. 7. Serve it with hot steaming rice.